Goa, a former Portuguese territory, for more than 450 years was described as ‘The Rome of the East’. Like Rome, it has developed into a holiday destination for many. More than 40 years after the departure of the Portuguese, Goa is perhaps the most westernised of all the states in Modern India. Music, dance, drama, food and feni, are a few of the things most Goans are passionate about. Religion is very important to the Goans. Churches, Temples and Mosques abound wherever you journey in Goa. Though, Goa is a multi-ethnic state, Goans are very tolerant towards each other’s faiths. St. Francis Xavier is the patron saint of Goa. Laws: One of the things that make Goa unique is its legacy of Portuguese laws. The common civil code, confers equal status to all religions, it favors no particular religion. The law also accords equal legal status to both sexes, in all matters. Perhaps, this is why the local women and girls of Goa are not so shy and reclusive, in stark contrast to the rest of India. Women’s dress code is influenced by western fashion rather than the more tradition (in India) Saree and Churidar. Goa is a beautiful land, with wonderfully hospitable people. The people of Goa are generally well educated; the literacy rate is high. Despite this, the caste system is still prevalent, in defiance of government laws. Even the Catholics have their casts, borrowed from the casts of their Hindu forefathers. Sports are very popular with the locals. Bull fighting (Dhirio) used to draw huge crowds, but now the courts have banned it. Unlike in Portugal, it is not man against bull, but bull against bull. The Dhirios were held in the local paddy fields, no walls or fences to separate the audience from the fighting bulls. Consequently, sometimes a spectator was gored or killed. For this reason the fights were banned. Although gambling is illegal, vast sums of money used to change hands at these fights. The two main sports of interest now are football (soccer) and cricket. The staple diet of Goa is fish curry and rice. Unlike the rest of India, most Hindus in Goa eat fish. The other favorite dish is pork, although chicken is a close second. Goa has its own alcoholic brew – FENI. This is the local drink in Goa, brewed from either coconut sap or cashew fruit. Goans love music. It is an integral part of their lives. Music in Goa covers a broad spectrum, from Portuguese music to Techno to Rave and the now the (in)famous Goa Trance. The local radio station AIR (All India Radio) mostly plays music in Konkani, Hindi and English. Though occasionally, we still get to hear some Portuguese music. A Dutch priest, Fr. Harve Barzen, is believed to be the first to introduce Goans to Western religious music. Later, under the Portuguese, who conquered Goa in 1510, the knowledge of Western music was imparted in local parish schools. Though the Goans have derived their music from the Portuguese, Goan Folk Music is a blend of Western music and Hindu temple Music. The Goan economy is highly dependent on tourism. This has resulted in an upsurge of hotels, resorts and other tourist related businesses, all along the northern coastal area. The exports of iron and manganese ores are also big earners for Goa. In Goa unlike the rest of India, the mining industry is privately owned and not controlled by the government. Sadly today there is a huge migration of highly skilled leaving it’s shores in search of greener pastures overseas. Goa is getting the tag of a ‘Place to Retire’. The Working local Goan population is getting to be mostly middle aged, as most young people are either working in the Gulf region, or migrated to USA, Australia or New Zealand. So this is Goa, amche Goem – its culture and people. Goa’s 105 km coastline is endowed with lovely beaches such as Vagator, Anjuna, Calangute, Baga and Harmal in the North of Goa and Colva, Betul and Palolem in the South. Some of these beaches have already become world famous. 1367 – Conquest of the kingdom of Kadamba (of which Goa was the capital) by the empire of Vijaynagar. 1380-1454: Rule of Vijaynagara governors. 1469 – Capture of Goa by the Muslim Bahmani king, Muhammad Shah II. 1454-1471: Rule by Bankapur chiefs. 1488 – Capture of Goa by Yusuf Adil Shah (“the Sabayo”) of Bijapur. 1471-1489: Rule of Sultan of Bijapur. 1498 – Discovery of the route to India by Vasco da Gama. 1489-1510: Yusuf Adilshaha rules over Goa. 1510 – Capture of Goa by Afonso de Albuquerque. 1515 – Defence of Goa against Ismail Adil Shah (“the Idalcan”). 1542 – Arrival of St. Francis Xavier. 1543-1783: Portuguese aquire Bardez and Salcette from Ibraim Adilshah. 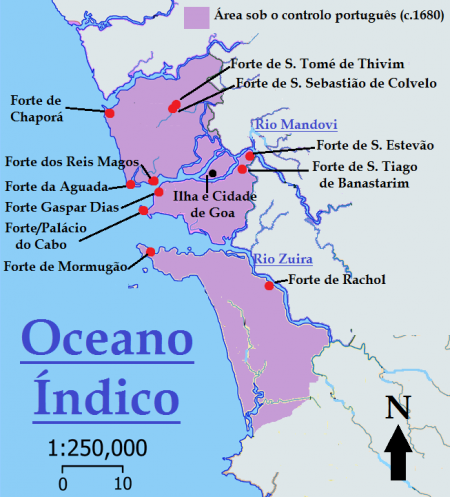 1570 – Siege of Goa by the Idalcan. 1510-1543: Portuguese rule over a limited territory of Goa, mostly Tiswadi islands. 1595 – First Dutch voyage to the Indies. 1600 – English East India Company’s charter. 1642 – Treaty between England and Portugal. 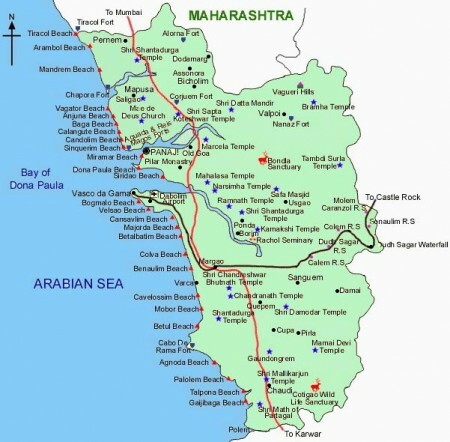 1683 – Attack on Goa by Marathas under Sambhaji. 1695 – Viceroy moves his residence out of the city of Velha Goa. 1741 – Marathas and Bhonsles defeated by Portuguese forces. 1749 – Expulsion of the Jesuits. 1759 – Viceroy takes up residence in Panjim. 1764 – Acquisition of New Conquests. 1778 – Acquisition of Pernem. 1783 – Portuguese annex Pernem. 1788-1799: Portuguese rule extended over entire Goa. 1797 – Occupation of Goa by British Army. 1813 – Withdrawal of British Army. 1821 – Goa represented in Portuguese parliament. 1843 – Panjim declared the capital of Goa. 1881 – Commencement of railway building in Goa. 1905 – Development of iron and manganese ore mines. 1961 – Goa incorporated into the Indian Union. 1987 – August 12th, Goa gained statehood. 1961-1987: Union territory of Goa, Daman and Diu. May-30,1987:Goa becomes a state within India.